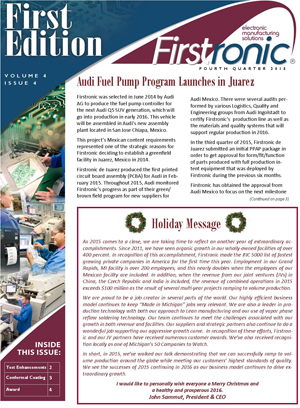 Fuel pump program launched for Audi, Account Director hired to enhance program management model, standardized functional test platforms provide consistency in multinational manufacturing programs, conformal coating capability expanded in Grand Rapids and Juarez, Maquiladora industry celebrates 50th anniversary and Firstronic wins Corporate America award. 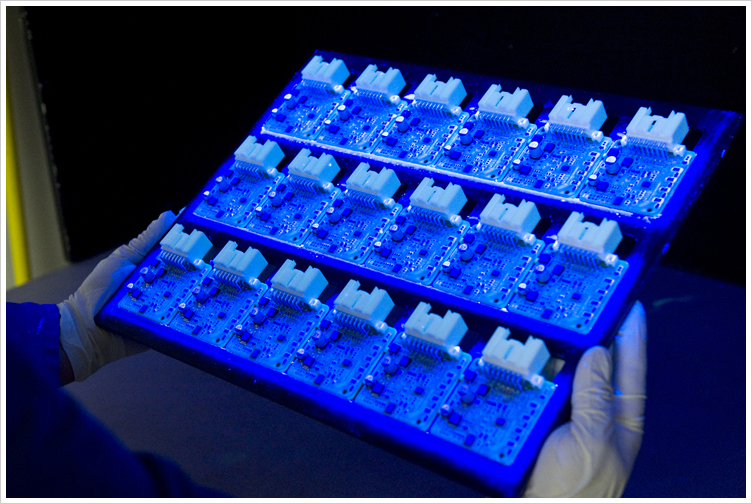 Global SMT & Packaging Magazine looks at Firstronic’s successful multinational expansion strategy. 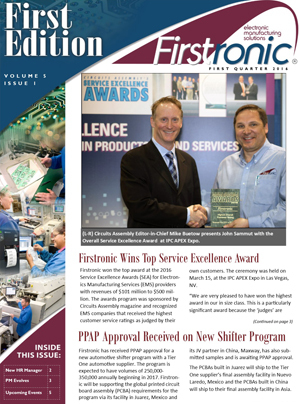 Firstronic ranked 1685 in Inc. 5000, Multinational shifter program highlights global expertise, Juarez adds second vapor phase soldering system, Charity Golf Scramble raises $10,000 and second blood drive held. 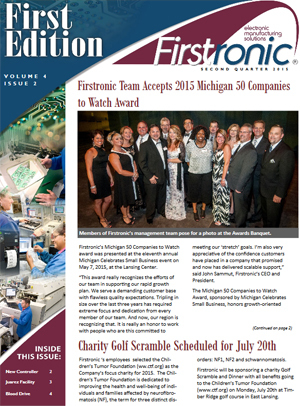 Inc. magazine has ranked Firstronic No. 1685 on its 34th annual Inc. 5000, an exclusive ranking of the nation's fastest-growing private companies. 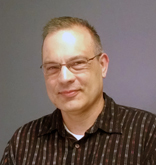 Firstronic, LLC has promoted Orland Baas to Chief Financial Officer. Michael Rogers, Vice President Communications for the Small Business Association of Michigan, talks with John Sammut, President and CEO of Firstronic, a member of the Michigan 50 Companies to Watch. A brief look at how pre-assessment surveys can help match employees with the best job. Michigan 50 Companies to Watch award, an overview of our joint venture strategy, TTPL award and links to an article and video on ways our Plex ERP system helped speed our facility launch in Mexico. 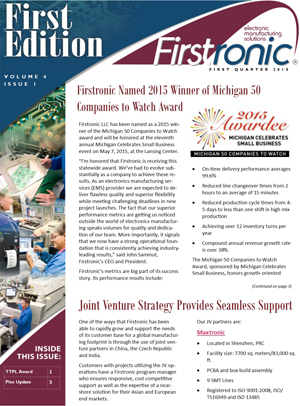 Firstronic’s innovative approach to hiring and training employees to support its rapid growth in Michigan is featured in this Association for Manufacturing Excellence article. Plex, Firstronic’s cloud-based ERP supplier, announces release of a video highlighting how its system helped Firstronic launch its Juarez, Mexico facility in just 90 days. 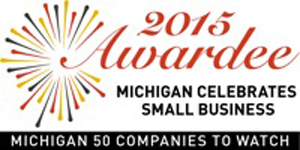 Firstronic LLC has been named as a 2015 winner of the Michigan 50 Companies to Watch award and will be honored at the eleventh annual Michigan Celebrates Small Business event.